Polycom Trio Review: "Trio Tips"
The Polycom Trio is being used across the entire organization. It is being used by all departments to interact with each other, hold conference meetings between plants and offices as well as with clients and suppliers. The business problem it addressed was to help move us into SIP trunks and move our telephony into digital systems. The microphones are extremely sensitive. They make it easier for soft spoken individuals to be heard clearly. It is easy to operate. Once connected through Outlook all it takes is one click to get to into a meeting and two or three to bring in outside attendees. They are still providing updates at an alarming rate. Stability seems okay but it is worrisome all the interactions that are taking place. The microphones are very sensitive and that is a plus but it is also a liability and we need to be completely clear on what we want others to hear and mute the phone when necessary. Everything gets picked up. It is well suited for any conference or meeting of up to 25 attendees. It is inappropriate for large rooms without additional microphones and speakers. It is appropriate for any circumstance in which you would normally use a conference phone. It is not easily portable and difficult to configure, so where it is set up is where it will likely remain. Polycom Trio Review: "Trio has worked wonderfully for our organization"
We use the Polycom Trio to video conference with locations across countries. We use the Skype integration for the video conference capabilities. It is used by the whole organization and helps us to communicate face to face with users spread across North America. Lync/Skype Integration - The Trio can be used in an existing organization that regularly uses Skype for Business, it makes the user experience seamless. Phone Conferences - If you have the PBX Licenses installed, the phone can be used to dial out and receive phone calls inbound. Sound Clarity is very good. Video Conference - Fair video quality for using existing Skype for Business infrastructure. Skype Functionality is a bit buggy, at least on earlier versions. Updates have improved functionality, but i'd like to have an easier way to manage the content displayed on Screen. Ability to use as a SIP phone while still using Skype functionality would be the best feature, unfortunately the way it currently works, you can only either use the Skype functionality or the SIP Functionality. Which means we have to pay per month for Skype PBX Licenses and cannot integrate directly into our PBX with an internal extension. This is well suited for an Office 365 environment, or people looking for an entry-level video conference system. Polycom Trio Review: "Trio 8800 great for audio, and works well with Logitech SmartDock"
We have 3 Polycom Trio 8800s deployed in our 3 conference rooms which connect to Skype for Business online cloud PBX. The Trio devices serve as the main mic and speakerphone for our conference rooms and allow our organization to have crystal clear audio communications, enabling better communication and group collaboration. The mic has excellent range and noise canceling , which is really important for conference rooms. The speaker is loud enough for a large room and has great quality. The trio is very versatile. We originally deployed them as part of the RealPresence Trio which paired with the Visual+ device over POE. After Skype Room Systems came out, we purchased 3 Logitech SmartDocks and now run the Trio's in Skype USB optimized mode as the Smartdock's mic/speaker. It was frustrating to not be able to share a user's desktop in a Skype for Business meeting using the People+Content. From a design perspective, I don't like how the USB port is on the side. Now that we're running in Skype USB optimized mode, we are unable to hide the USB that connects to the SmartDock. I wish that it had a secondary option in addition to POE to provide power to the unit. Running one powered usb cable from the Smartdock to the trio would be ideal. It is excellent as a standalone conference phone for small to medium-sized rooms. In larger conference rooms with more people (12+), the speaker and mic work surprisingly well but it picks up every little sound made by the attendees, and the more attendees the more distracting it can be for the people on the other end of the call. We purchased the extender mics, more to extend the mute button around the table than for the extra mics, but the cords are so short, they are almost pointless. The Trio works really well in a Skype Optimized USB mode, even with the Logitech SmartDock. Polycom Trio Review: "Great Medium-Small Conferencing Device"
We have it installed in our board room, however we have realized that it is not the right device for the room size. It is much more suited for medium to small sized meeting rooms. Generally it works well, and since we have the same 8800 with Visual Plus in our Berlin office that makes it easier. It integrates well with Skype for Business. Best suited for small to medium meeting rooms. It is not the right product for a large room or personal space. We've deployed Polycom Trio to our organization using it as video conference phones with other offices within our organization. The use of video reduces the organization's needs for travel. It also allows our company interact better and to meet clients in other offices. It's a seamless way for our organization to collaborate and better serve our clients. Integration with Cisco phones could be better. Connectivity with Visual+ system is sometimes an issue. Support for the product was an issue when we first deployed and still an issue when we encounter issues with the product. The Polycom Trios are great products for organizations that need to deploy video in confererence rooms. The integration to our Cisco System was easy. However, initially we had issues with our other Cisco video endpoints and this was addressed with subsequent firmware updates. Where Polycom Trios lack is support for issues that occur on the Polycom 8800 Trio. Polycom Trio Review: "Great product"
We use the polycom trio for all of our conference rooms. Since we are mostly a workstation driven environment we have to configure it to be used as a USB enabled device with the computer. The screen and user interface is fantastic. Along with the expansion mics, the range of the microphones are great. I would like to see a BTOE feature with the polycom trio since we use computers in all of our conference rooms. Add the option to dial using the interface on the trio while the trio is in USB mode. The trio is good for small to medium sized conference rooms. The speakers are fantastic but the developers should add additional features to better integrate with the Skype for Business client. Review: "Polycom Trio is great - in the right setting"
We decided to try the Trio after seeing a demo of it at Polycom's office in NYC - we were incredibly impressed with what it could do, how easy it was to use and it was relatively cheap given the functionality. We decided to use this in some of our small conference rooms - less than 5 people. Or also use it for some of the higher execs that have a conference room setup in their office to give them video conferencing capabilities. Connecting to a Video Conference meeting - set up a Skype for Business meeting and tap Join. Fairly intuitive and easy to use - We put the first one in a small conference room with the only instructions is to create your meeting as a Skype meeting. We didn't include any instructions on how to actually use the Trio to see if people could figure it out. For the most part, they did. Content Sharing - Ideally, we couldn't figure out how to connect a laptop to the Trio to share for the meeting. Instead, you had to sign into the meeting itself on Skype, then present your desktop. However doing this, you had to be aware to mute your microphone/video otherwise it would create a ton of feedback/echo. Users struggled with this. Trio would sign out - Our rooms are setup with their own accounts, so you invite the room you want to have the meeting it when creating your Skype meeting. However we had problems that the trio would routinely sign out of this account. When it did, the room couldn't join any meetings. Setup as a SIP phone - While we were able to set the trio up as a standard SIP phone to our VoIP system, we couldn't do this and have it in 'Lync mode' at the same time. This wasn't a huge deal because ideally, users would dial into the Skype meeting or you could make an outgoing phone call via Skype. But some users were used to dialing this room's extension directly which they could no longer do. This worked best in a personal office, such as some of high execs that have a conference room setup that is used by 1 person. It didn't work as well in a conference room used by multiple people. Polycom Trio Review: "Great hardware, not so great support." Trio is a wonderful addition to an Office 365 Skype setup. Once implemented it is seamless. Trio fills out the 'last mile" of a unified communications solution, making every conference room connected with the wider eco-system. Polycom's hardware is great. Their re-sellers and support however are awful. If you can figure it out yourself it's brilliant. If you are relying on re-sellers to implement properly... good luck, unless you are a huge client. Best solution for Skype for Business. Polycom Trio Review: "Good, Flashy phone"
We use it as our main conference room phone, and on conference calls. It is used across the whole organization. It's a good phone, but the ceilings are high in the room it's being used in - and the mic has a hard time adjusting to that. It's good for smaller conference rooms. Not great for big conference rooms. Polycom Trio Review: "Clarifying the Trio Device Experience"
Currently, the Polycom Trio is being used in two main offices in the company. One in the United States and one in Mexico. The business problem it was intended to address was aging equipment and also to ease the manner in which associates join electronic meetings. It was also intended to assist with video connections and make that interaction easier and simpler for associates to use. The device is sleekly designed. It looks well in almost any office décor. The sound system on the device is excellent. It picks up minute sounds and transmits them with crystal clarity. The operation of the device for an IT Professional is simple. To get started or end a call is as simple as pressing a button. The programming of the device is clunky. There is a central system for handling this and the way it is designed is different from most of the telephony systems that we work with. Having to pay attention to proprietary systems for generic operations can slow things down. The sound system is a little too well developed and this is not normally made known to the users. As a result, information, statements and other sounds may be transmitted that are not value added. The systems have been prone to a number of updates that need to be installed or they can impact the behavior of the system. It is well suited, I believe, in small to mid-level organization where use will be light to moderate. It is useful in a situation where both ends have the same equipment, the same model and the same software release upon them. A scenario where it might be less appropriate is single-use installations and large corporate environments. Though in the future it may become more adapted to the 'open range' of telephony systems right now the system is best when working with others of its kind. It is also inappropriate in a situation where the organization does not have a fully developed Information Technology team or arrangement with a telephony contractor to handle the devices when things go wrong. Polycom Trio Review: "Trio 8800 and Skype for Business"
We have reduced our use of the Trio. Originally purchased for its Skype video capabilities and to present items on a TV/projection screen for meetings. Due to the slowness of video we have reduced its use for primarily audio calls. A recent firmware build has brought better performance for local screen presentations. But this will not be rolled out until we can properly vet this for many users. Original plans were to roll this out to 15 offices. Instead we have in only 3 locations. Audio conferencing is wonderful. This product really excels at audio. Connecting up to Skype for Business Online, we have been able to place regular phone calls as well as Skype based calls. Quality of audio is excellent. This really depends on the amount of bandwidth you have. I really recommend if you have over 5Mbps of available bandwidth. Miracast functionality was recently added. This support needs some improvement before it can be relied upon. Sometimes you will be able to connect right away, other times you may have to make several attempts or force a reboot. Skype web conferencing needs a little work. You can easily connect up to Skype for Business Online. Viewing content from others can get bogged down at times. This has improved quite a bit over the last 1.5 years. This still needs some extra help to make this a reliable service. Skype video calling with Skype for Business Online works well when done one on one. When you have 5+ users from remote locations, this can become very slow. A reboot fixes the problem but how often can you keep pausing a call so you can reboot an endpoint. The best use case for the Polycom Trio is for audio based calls. This product excels at audio. If you have the bandwidth, this is an excellent device. Firmware upgrades are easy and fast. Management of these devices can be done with a provisioning server or with the built-in web portal. User Review: "Polycom Trio - Great sound!" We use Polycom Trio primarily as a speakerphone. It's used facility-wide. We like it because of the sound quality of both the speakers and the microphone. It's intuitive and easy for users of all skill levels to use. Our managers like that they can connect their phones via Bluetooth to the phone so that they can "transfer" a call on their cell phone to a speakerphone in a conference room. Microphones can be too sensitive at times. We primarily use it in our conference rooms as a speakerphone. I would not use it in a factory floor setting, nor in an open office environment. I think that a factory floor would be too noisy for the microphones. I won't use any speakerphone in an open office environment because some people are just rude. User Review: "Polycom Trio works!" Polycom Trio is a great tool for collaboration. It is used in our conference rooms, by staff at every level of our organization. The ease of use is especially beneficial. Due to ease of use, there was no real need to develop a training module for staff. It is truly user-friendly! Ease of use. Staff can immediately use the tool without extensive instruction. No real cons noticed. The ability to add video conferencing in the newer model is greatly appreciated, not currently deployed in our organization. In our organization, it is more suited for small groups instead of large meetings. User Review: "Polycom Trio - a game changer"
It's used in our resource centers throughout the world. It serves as a great AV, content sharing, Skype for Business integrated ecosystem. We have it installed in relatively big conference rooms where multiple participants can sit in and connect with the same number of participants on the other side. It's been a great experience so far. We are looking into expanding its use to more branch offices. The content sharing can be improved; especially to be able to plug media directly into the Trio. Greatly suited in a Microsoft shop, especially in an Office 365 shop. The integration with Skype for Business Online is awesome. Very well suited in an environment where the user community is very keen and experienced in scheduling meetings using SfB. It's maybe not very well suited in an environment where there is no TV. 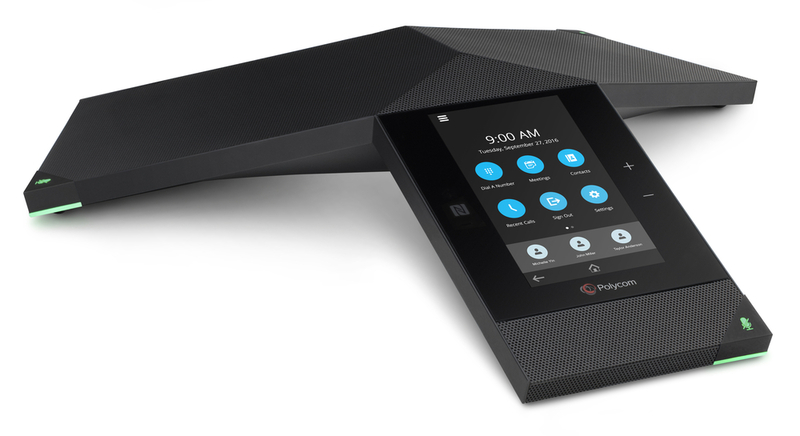 Review: "Polycom Trio: A good Skype for Business solution for smaller rooms"
We are embracing Skype for Business as our default teleconferencing solution, so we want to enable users to connect to Skype meetings any time, any place. The Trio is one of our solutions for smaller sized rooms/huddle rooms. One-Touch joining to Skype meetings. It is a fantastic phone that looks like those that users are used to, but with a sleeker more modern look. All-in-one package. There is no need for other equipment to join a Skype meeting. Not having an HDMI input is the biggest failure of the Trio. Having to join a Skype meeting to present in room is not a good solution. The video quality is not as good and it introduces a lag. Many configuration options should be available through the web interface instead of the more complicated/time consuming deployments. Not being able to see both content and webcam view at the same time is a hugely missed opportunity. We don't use this, but if users wanted to log in to their own accounts, typing in the small touch panel is slow and cumbersome. We have Skype Room Systems for our bigger rooms, which are full-fledged solutions. The Trio has a lot of missing features compared to those, but it is a good solution/balance for smaller huddle rooms where it might not be cost efficient to implement the higher-end solutions. The Trio is not well suited for bigger rooms as the audio wouldn't scale well. Not having an HDMI input really hurts it and complicates the user experience. as opposed to calling in on separate lines from our desks. Call quality is extremely high. We can hear clients on the phone, and we can all be heard without shouting. I think it's a well thought out phone, I don't have any complaints or changes. The trio is well suited for any business looking to handle conference calls in a open setting with 5 to 10 employees. Polycom Trio Review: "Best in Class"
We have standardized on the Polycom Trio for all of our huddle rooms globally. The Polycom Trio is the best speakerphone on the market for small to medium-sized meeting rooms. Review: "Small Company Very Happy with Polycom Trio"
The Polycom Trio is being used my my entire organization. We are a small company with a conference room used for calls with multiple people and for people without offices. It allows us to have professional conference calls with clients, coworkers, contractors, and remote employees. It is very appropriate for conference calls in a small conference room. It would not be as appropriate for larger conference rooms. We are currently using the Trios in rooms that have seating for 6 to 12 people where the sound radius is still under the Trio limits. Our rooms have monitors or projects so that we can utilize the Visual+ boxes. If the room has a monitor we also utilize the Logitech camera. We currently have 46 Trios deployed in three locations with another 60 to be deployed in four additional locations. We are deploying the Trios as a cost saving measure to avoid purchasing large conferencing room systems. We also are looking to keep more of our users while in meeting rooms from calling out to the PSTN to use native Skype audio. One touch accessibility to your meetings is a key feature we use with the Polycom Trio. No guess work to dial a number or remember a code and you also get to use Skype natively. The sounds quality for the Polycom Trio is very good. Our larger rooms can have full capacity and all voices are heard to the users on the other end. The Visual+ module with the wireless sharing has so much lag that it makes is almost useless for our customers. As a result we are forced to keep another wired connection to the monitors and projectors in our rooms. The inability to for the Polycom Trio to not work with the industry standard Polycom Ball microphones limits us from putting this device in rooms with the ball mic uplift system. The Polycom Trio has a buggy interface and earlier this year we were upgrading firmware on this model so often that users didn't know what interface they were going to see. Huddle rooms to medium sized conference rooms with a monitor and less than 12 people I believe is the best place for this device. Especially where video is not very important. If you want a video rich experience then you want your customers to have a wireless sharing experience second to none then the Trio is not the way to go. Polycom Trio Review: "The Polycom RP Trio is a Solid Solution"
We use the Polycom Trio in our conference room across our organization. It provides our conference rooms with a high quality Skype for Business audio experience. We are in the process of replacing legacy conference room phones with the Trios. The feedback we've received from our end users on the Trio's audio quality has been outstanding. What a great product! The Trio has top notch audio quality. The direct integration with Skype for Business works well. The ability to remote manage and configure the Trio devices is helpful and somewhat a must in the enterprise. I would like the micro USB input to be located under the phone so it's out of sight for users that like to unplug things. A longer cable for the expansion microphones would be preferred so the cables could be run under the table (the cable path is not always direct). The Trio is well suited for a medium to a semi-large conference (depending on the size and layout of the conference room). It also would be a good solution for an executive office where the executive prefers using a speakerphone and might have others in their office during a conference call. The Trio is not a great fit for very large conference rooms or a room where the furniture gets reconfigured often. User Review: "Polycom Trio; should I use it?" Single unit type for conference rooms small, medium, large or huddle rooms across the whole organization. This is also provided to all Executives sitting in cabins to act as puck (speaker) for PC based Skype for Business Client. It addressed the need to maintain inventory to minimum. All voice conferencing (and some video as well) is addressed with this device. User intuitive touch panel, configurable touch icons on screen. Single touch (JOIN) function with calendar integration. Should work on stability of upgrades being provided. Smaller form factor may be more useful in executive small cabins, 2-4 seat rooms. Medium to large conference rooms and some huddle rooms are the best locations to use these devices. Polycom Trio 8800 is a conference phone system that offers high-quality audio, as well as the ability to add video conferencing and HD content sharing. RealPresence Trio is Skype for Business on-prem and Office 365 Skype for Business Cloud PBX certified for conference calls and supports a 1080p30 USB camera for video conferencing. Users can share content from their personal devices, facilitating a BYOD (bring your own device) approach to collaboration.